I have never been a pre-washer (except for flannels), but I'm making a commissioned quilt with deep purples and greens so ... did for someone else what I haven't been willing to do for myself. I threw a white terry dish cloth in each load just out of curiosity. I did 4 loads - one of greens, one purples, one blacks, and one the purple backing. It's the backing that did the most damage. So ... more trouble? You bet! but ... can't imagine all my hard work and her hard dollars ending up like this if I hadn't pre-washed. 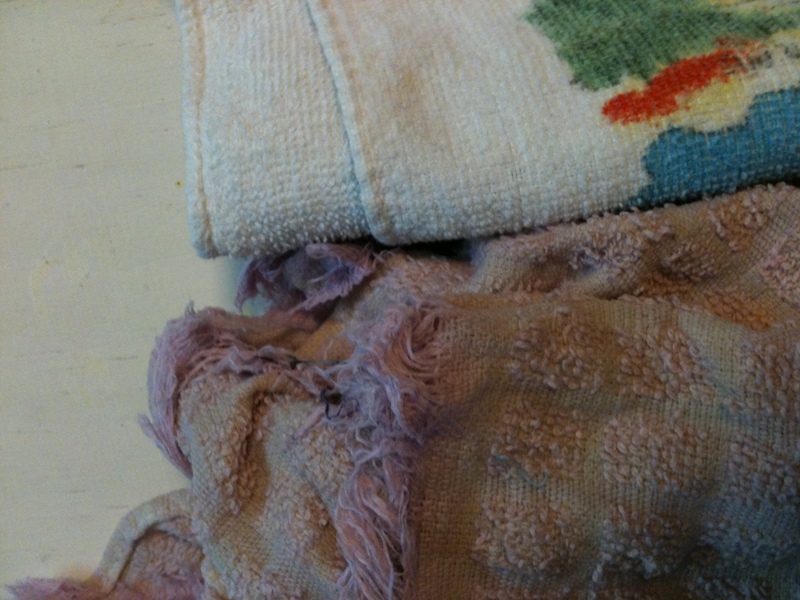 The picture is two dish towels - one that was washed with the purple backing and another for comparison. Very graphic example. So does this mean you will be prewashing for yourself from now on??? Good question and probably not! I've always prewashed flannels and have done some deep colors. The few I've done with colors this deep were baby quilts so not quite so much fabric to fool with. As a general rule? Nah! Isn't it amazing? I'm always impressed by how much dye is in my color catchers. I'm a dedicated pre-washer, myself, and sometimes I wonder if it's worth all the hassle....then I look at my color catchers and think..."yep, worth it!" purples are tough, even when you dye your own cloth. I made a purple and green baby quilt once. Those marbles mixed with butterfly fabric. I tested the purple/greens and... yep, they bled. I prewashed those more than once and gifted it with a box of Color Catchers. I also found that some of this very nice fabric went a bit wonky. Interesting! I just washed an I Spy quilt that I made with some blocks from an exchange. I always prewash my own fabrics. The color catcher came out pink. I'm glad you decided to pre-wash the fabrics. Tell your client to always wash the finished quilt with a color catcher or two. That is what I do. Pre-washing is purely a personal preference. However, having said that, I have always pre-washed; at first, because I was taught to do it when I learned dressmaking 40 years ago. Then, when I started working at the LQS, my boss told me about all the chemicals used to treat fabric so that insects and other vermin would not be attracted to it during shipping to the US. You wouldn't believe how sticky and nasty my hands get after a day of cutting fabric at the shop! Anyway, now I pre-wash everything just to get those chemicals out of the fabric before I start working with it. It's one of the reasons I don't normally use precuts. I just threw away a piece of deep blue batik that my BFF had - she passed away and I got some of her fabric. I hand washed it in my pure white dish pan with just a drop of liquid soap in lukewarm water and it turned my water a brilliant blue. After about 4 or 5 rinses it was still brilliant blue - so I threw it away. It wasn't a very big piece, maybe 1/2 yard at the most - so not worth getting any of those chemicals to try to make it stop bleeding. The last quilt I made was a deep burgundy and it wasn't prewashed. A big mistake. When I was assembling the pieces together on the machine my hands were dyed red (from body heat) and the base of my machine has red dye on it. As I was quilting it I was wearing an old pair of canvas shoes and the dye even wore off on those! This made a pre washer of me! This wasn't "bargain" fabric, either. I am a pre-washer. Just this week my husband got new work uniforms (he works as a fitter/welder in the automotive trade). Washed them all (and cut and hemmed the pants). After day three he had a massive allergic reaction, everywhere the fabric touched he had swelling, welts, heat and itching. As the dye didn't run I guessed it was formaldehyde. Soaked them in boiling water, rinsed, soaked in milk and cold water for 2 hours, rinsed in cold water and then washed as usual with a vinegar rinse. The problem seems to be solved. This is the first time he has been allergic to anything, and he is as tough as old boots (the kids call him "The Machine"). So even pre-washing, for some things isn't enough. I use a product called "color catchers". You would be simply amazed how well they work. The "sheet" of color catcher that is in the washer would look like your purple towel above and everything else - including white - would have no fading on it at all! I do no pre-wash. I use the color catcher when the quilt needs washing. When given as a gift - I include a box of color catchers with the quilt. OK... think y'all have made me a believer. Going to buy some of those "color catchers" then get busy washing some fabric. So are you going to wash it again and see if it still bleeds? I would. That's a lot of color on that towel. I always pre-wash. I HAVE to get the chemicals out of the fabric before I can use it. What I have trouble understanding is this, why is it so hard to throw the fabric in the washer. It's just like a load of towels or clothes. I throw the fabric in the washer,put some detergent in and walk away and do something else until the machine is done. Then I throw the fabric in the dryer,and again walk away and do something else. It really is not that hard of a job to pre-wash the fabric. When you take the fabric out of the dryer, it's clean and soft and ready to use. It's kind of a "On the one hand...on the other hand" kind of thing. When I think of ALL the fabric I've washed that did not bleed, I hate to commit to prewashing. But when I think of the small handful of fabrics I've washed that bled like crazy, and the quilt I made that was forever altered by bleeding, well, then, prewashing seems not so bad! However....if all of the fabrics in the quilt are deeper, richer colors, you may not notice as much if you get a little bleeding. Mixing those deep greens and purples with any white or very light fabric is where you could have really run into trouble. On the quilt I'm working on now, I considered doing some accent pieces in white...but almost all of the rest of the quilt is various colors of hand-dyed fabric and batiks. No way will I flirt with disaster by adding whites into the mix. Tooo much work to have a puckery off-colored quilt. It interesting to me that it seems that the issue of bleeding fabric has gotten worse not better over the years . There was a time I did not prewash and had no issues. Now I pre- wash because its seems there are more fabrics that are bleeders than there was years ago. Way back when I first started sewing .. red was always a highly suspect color... so we prewashed any red fabric. I agree Lori S. There was a time when fabrics didn't bleed like now. It's not that I mind washing the fabric OR that it's trouble. Knowing I'll have to iron that fabric to make it ready for quilting is what has been holding me back. OH WELL... guess I'll get friendlier with the iron! This is why I always prewash, I just like all the chemicals out before I use it!! !